Protesters gather near the scene of Saturday's massive truck bomb attack in Mogadishu, Somalia, Oct. 18, 2017. 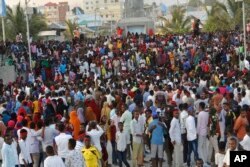 Thousands of people took to the streets of Somalia's capital in a show of defiance after the country's deadliest attack. Residents of Somalia's capital have developed an exceptional state of resilience over the years. They had to, given how often Mogadishu sees deadly warfare involving Islamist militants, troops from five African countries, and assorted government forces. on Saturday. By Tuesday, hundreds of young volunteers who had helped rescue survivors from the debris of demolished cars and buildings, cleaned up the rubble. On Thursday, the city began construction at the blast site to defy what authorities have described as a terrorist message meant to demoralize the city’s recent revival. “You see we are rebuilding the road at the blast site. Since it is a very important for the city’s movement, we are making it ready for the traffic to begin soon,” said Mogadishu Mayor Tabit Abdu Mohamed. The road construction began as the charred buildings around the scene of the blast were sealed off with corrugated iron sheets to prepare them for immediate rebuilding. Among Mogadishu officials and diplomats who visited the site on Thursday was EU Ambassador to Somalia Veronique Lorenzo, who said the extent of the destruction caused by Saturday's blast left her speechless. Protesters march near the scene of Saturday's massive truck bomb attack in Mogadishu, Somalia, Oct. 18, 2017. At the city’s new National Emergency Management Center, only half a mile away from the site, grieving families gathered in search of information about their missing loved ones. Although the government officially recorded the death of 281 people and nearly 400 injured, the whereabouts of dozens of the city's residents are still unknown. Their family members say they were at the blast zone the last time they heard from them. Government officials said some people were burned beyond recognition and others might have been turned to ashes by the flames. Deqa Aden Mohamed, a mother of three children, was there to find out information about her husband, Abdi Yusuf. “My husband was wheelbarrow porter. He left us the morning of Saturday, Oct. 14. Then he called us from his cellphone. That was the last time we heard from him,” she said. 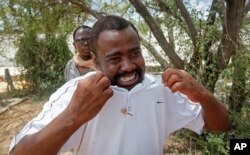 Abdulkadir Mohamed Osman talks about his missing son and younger brother outside a hospital in Mogadishu, Somalia, Oct. 17, 2017. Despite last weekend's attack, there is a remarkable resilience and change going on in Mogadishu. Thousands of Somalis from the Diaspora have returned over the past three years, with many opening new and Western-style restaurants along the beach. Buildings that were previously destroyed during years of fighting dating back to the 1990s civil war are now being rebuilt. “The ones destroyed by the recent bombing will only rejoin the already ongoing city recovery process, but will not prevent this city’s residents from moving forward,” said Osman Afrah, the owner of a small construction company. As the construction equipment hauled off broken glass and charred debris, watching residents told a VOA reporter who visited the site that the effort gave them relief and hope for future.